Use Tailwind's powerful Pin Inspector to find your best Pins and quickly Re-Schedule them for more visibility. 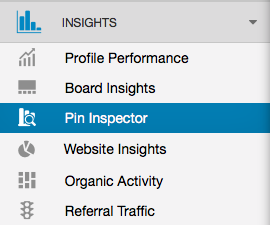 The Pin Inspector offers several different ways for you to discover data about a specific Pin that you've posted. The Plus plan includes your most recent 5,000 Pins that you’ve shared on Pinterest either from Tailwind or directly on Pinterest. You can use a keyword search, filter by Repins, Board, Website, or even Date Pinned! It can often be help to use Pin Inspector to quickly find great content to re-purpose in your marketing strategy for Pinterest. Here is an in-depth tutorial video of how to Find Your Best Content to Re-Schedule. Go to your Pin Inspector (located in the pop-out menu in the left hand navigation). 2. The search bar appears at the top of the Pin Inspector page and allows you to search for any text related to your Pin. You can filter for a specific word that appears in the Pin description to bring up a specific Pin or set of Pins. You can also type in a website to only show Pins from that website. 3. If you know which Board or Pinterest category your Pin is in, you’ll find ways to filter just below the search bar. You can filter for multiple Boards or categories simultaneously. You can also filter for Pins from certain websites. This can be helpful if you’re wanting to find a bunch of similar Pins (such as every Food & Drink Pin you have) and see what’s performed best. 4. You’ll be able to see Pins that were pinned during the date range that’s currently set. For example, if you know the Pin you’re looking for was Pinned sometime in May, or if you’re just wanting to see how all the Pins you pinned in May are doing, then set the date range from May 1 - May 31 with the appropriate year. If you can't go back far in history, then the pins were posted prior to your most recent limit for your plan. Helpful Tip: The Pin Inspector includes all your most recent Pins, regrardless if they were scheduled through Tailwind or not. All the Pins listed that have the little Tailwind logo just to the right of the image and lower side will let you know that pin was published through Tailwind! Sorting by Highest Repins is usually a good indicator that the Pin is doing well on Pinterest. On the right side of the Pin, click "Re-Schedule this Pin". Helpful Tip: Tailwind pulls from the Pinterest Marketing Developer Partner API to gather Repin data, however, it is not aggregated. Learn more about why it is still important to see Pins and their true Repin count on our blog. 2. In the pop-up box, choose the board, edit the description and "Schedule" or "Save as a Draft".